The hills of central and south-eastern Europe are alive with the sound of bulldozers. Across the high slopes of the Carpathian mountains, the Balkan and Rila-Rhodope ranges, an unprecedented construction boom is underway as the countries of the region gear up for a share of the lucrative British ski market. Selling themselves on cheap accommodation and cut-price après-ski, Romania, Bulgaria, Slovakia and Ukraine are throwing up chairlifts and hotels at breakneck speed, hoping that, by the middle of the next decade, they can offer a budget alternative to the 1.3 million skiers who leave these shores each year but who now find their finances squeezed by the collapsing value of the pound and the looming recession. Last winter, four out of 10 British skiers chose the French Alps for their mid-winter fix of downhill sport but that could be about to change. With the pound falling against the dollar and the euro, some estimates suggest that as many as three-quarters of skiers and snowboarders are looking to cut costs. America's slopes have been struck off many British skiers' itineraries, after a year of soaring aviation fuel costs. "Talking to a few of the operators going to America, no one is putting any figures on it but it does look grim because the dollar is so strong and because of the credit crunch, " said the ski writer and researcher Patrick Thorne. 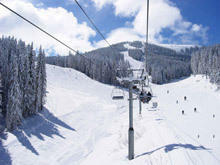 Many operators are slashing prices on some of the Alpine resorts. But few can compete with the value for money offered on Europe's new frontier. In Bulgaria's top resort of Bansko, a week's half-board in a four-star hotel is a third cheaper than three-star accommodation in the French retreat of La Clusaz. But it is when you take off the skis that the savings really rack up. A three-course meal in Bansko sets you back £6 per head while a bottle of beer costs 80p. At La Clusaz the same dinner and a beer would leave you £20 poorer. "Those countries that are not in the eurozone are offering a lot more for your money, " said Betony Garner of the British Ski Club. "They are particularly attractive to families who want to take young children for the first time. For beginners, the terrain is not as extensive as France or Austria but places such as Bulgaria are offering a good low cost alternative." With western Europe governed by some of the strictest planning rules in the world and many of the resorts groaning to capacity, growth in the market is spreading inexorably east – to the alarm of environmentalists. According to a report by WWF, the Romanian government is planning to build or expand 30 resorts across the Carpathian mountains, including projects in eight national parks. In the same range in Ukraine south of Ivano-Frankivsk, Bukovel, one of the largest winter sports complexes in the world, is currently being carved out of the mountainside. The £3bn resort will eventually boast 100, 000 beds and 66 lifts and could provide the basis for Ukraine's bid for the 2018 Winter Olympics. The Slovakian government meanwhile is accused of opening up the Tatras mountains to development, threatening their status as a national park. In Bulgaria, roads and pistes are being cut into the mountainsides of the Rila National Park, while in Bansko a new five-star Kempinski Grand Arena Hotel has just been completed at the lift base and major investment has helped transform the notoriously slow and breakdown-prone lifts to match standards found in the Alps. There is concern that much of the new development in the region, funded by national governments and the EU, could be redundant as early as 2030 as global warming renders the relatively low mountains – some as little as 1, 500m above sea level – snow-free for much of the winter. "We need to think twice about the ski areas across our region, " said Andreas Beckmann, deputy director of the WWF Danube-Carpathian programme. "Thanks especially to climate change and other factors, in many cases we risk having white elephants dotting our increasingly green mountains – expensive investments whose cost, both financial as well as social and environmental, exceed their supposed usefulness."